So there I was relaxing with my gf while watching the French edition of GBO, Le Meilleur Pâtissier, which is just like the British Bake Off, but in French and they focus more on the art of the pâtissier than the baker (for which of course there is a whole other show Le Meilleur Boulanger). Anyway, with the first challenge out of the way, where the contestants have to reinvent a French classic such as a Paris Brest or Tarte Tropeziénne, we endured an overly stuffed commercial break when I saw something that made me almost fall out of my fauteuil with surprise. 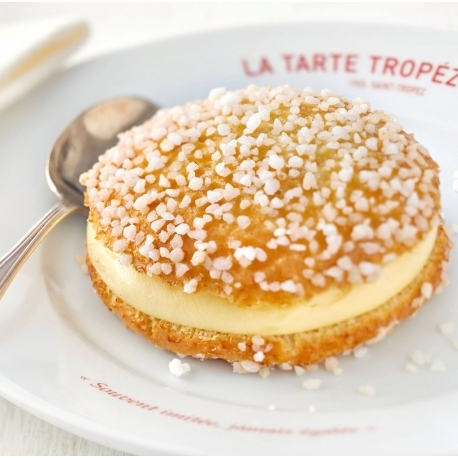 Une Tarte Tropézienne, heaven on Earth. It was an advert from an ISP, but not any ordinary ISP and at first I had to take it with a suitably large dose of salt. The Swiss ISP, Salt, were advertising, on primetime TV, consumer internet services for just under 50 of those strange Euro things a month and for that you got a whole pile of content, an AppleTV box and speeds of 10Gbps. Yes, you read that right. 10Gbps. 10,000Mbps. Symmetrical - the same speed upload and download. If you’re the type of person that reacts to this by saying “Zut alors! No one needs 10Gig speeds”, then stop reading now. If on the other hand you reacted by saying “ohlàlà, c’est fantastique!” then stay engaged. In the UK, our average broadband speed has increased over the years and is now clocking in at a wheezing 46.2Mbps download and an even feebler 6.2Mbps upload and the industry and regulator are patting themselves on their backs. Well, almost all the industry. CityFibre, a fibre optic network infrastructure provider is taking the ASA to court as the ASA allow the likes of BT and Virgin Media to promote their electrical and copper-networks as optical fibre ones. You can find out all about City Fibre’s “Coppersaurus” campaign here. Analogies are always tricky, but here’s one that works reasonably well. Both are cars, but no one would be allowed to claim the Ford Model T is a modern electric supercar such as a Tesla. Spot the difference. Both are cars, both have 4 wheels. But their performance isn’t comparable. Most broadband networks in the UK reach our houses with copper wire and the signalling that’s used over the copper wire is good old-fashioned electric. Electrical signalling over copper wire. That’s what Mr Alexander Graham Bell did 150 or so years ago. Electrical signals in broadband networks have become much more sophisticated, and the latest version is called G.Fast, which you can read all about here. Suffice to say, G.Fast suffers the same fundamental laws of physics problem that all alternating current over copper wire does: impedance. The speed decreases with distance. In G:Fast’s case, this happens over very short distances - 300m or so and it starts to run out of puff. In the beginning there was ADSL broadband. Then ADSL 2+. Then “Superfast” VDSL broadband, which being electrical and based on copper wires, being asymmetrical, being slow, and being unpredictable, is neither super nor fast. Ultrafast broadband uses some or no copper wire in service delivery. It all depends on where you live. If you’re lucky, you’ll be in an area where the type of broadband network available uses just optical fibres, and you’ll be the lucky recipient of 314Mbps download and 49Mbps upload speeds. If you’re not quite as lucky, you might get similar speeds from an Ultrafast service, but it’ll be delivered on copper wires with G.Fast electrical signalling. While this isn’t all that fast, it’s better than most copper-wire plus electrical signalling services and comes with a 100Mbps money-back guarantee. I can see what BT is doing here. Their network has some fibre to the home (FTTH) but it’s mostly copper wires carrying electrical signals to the home. Their fibre optic network infrastructure uses an architecture and “passive” technology called GPON. GPON delivers asymmetric services at approx 300Mbps download and 30Mbps upload. By using G.Fast on copper wires where they don’t have GPON-based optical services, they can claim a larger service footprint, and service parity between the electrical and optical. But the short range of G.Fast means it’s not available to many people, and the only way of guaranteeing 100Mbps is to limit the length of the copper wire - so reaching even fewer people. This is of no help at all in rural areas, where houses can be Kilometres away from the nearest street cabinet. The xDSL effect. The reach is Kilometres, but the speeds are lower. Even so the reach isn’t far enough. My Dad lives 15 miles from central London and never gets into double digit download speeds. I know this looks like 1970s wallpaper, but it represents the result of the laws of physics electrical signalling over copper wires has on the delivery of broadband services, and explains why the speed you get is a post code lottery. 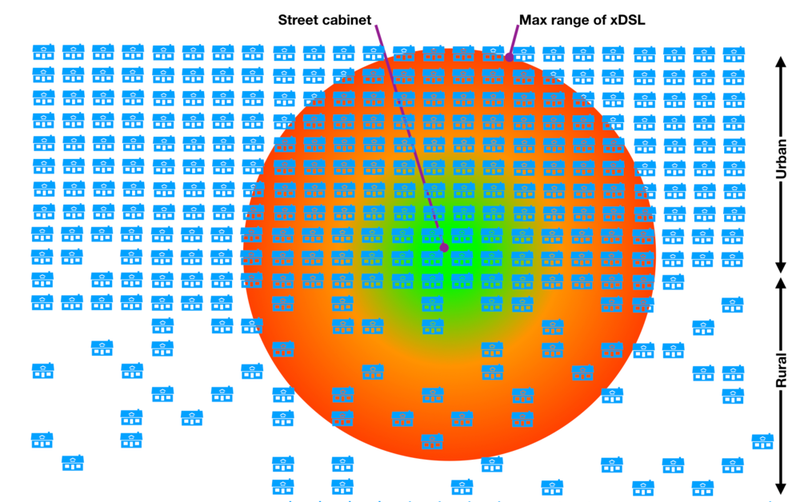 Each street cabinet is a hotspot that rapidly cools, as impedance degrades the electrical signal, and hence the speed. G.Fast exacerbates this issue, which doesn’t happen with laser light through glass fibres. At least not over the short distances for broadband, even in the remotest parts of the UK. Not to scale obviously. Virgin Media, the rebranded remains of the failed NTL, also uses an electrical network, but with copper coax cable that has a different signalling system from that found on electric plus copper wire networks. This signalling system is called DOCSIS and the next version is mooted to reach 1000Mbps, but whether Virgin plan to roll this out is a moot point. New service providers, or those with a more ambitious, adventurous strategy, or those unencumbered with a legacy copper network, or with a more innovative investment plan, use a different network architecture and technology for their ”pure” fibre optic network - they have no copper wires at all. This different architecture combined with the inherent imperviousness to distance (laser light through optical fibres is after all used for trans-ocean networks, connecting continents), means they are able to consistently deliver astonishingly high speeds. In the 90s I had a spirited conversation with a senior executive of France Telecom, who maintained that a speed of 256Kbps would be fine. These days, the “gold standard” of domestic pure fibre optic networks is 1,000Mbps symmetrical, or 1Gig as we like to say in the industry. But the next step up in this particular architecture is 10 times as fast, in both directions - a full 10,000Mbps. And we’re starting to see these services emerging. And that’s what I saw being advertised in prime time Swiss French TV. Another way of looking at it is as a “graph”. I’ve updated the original version of this to include 10Gbps services and to also reflect today’s service speeds in the UK, download is green, upload is red, 1 vertical pixel = 1Mbps. You might need to zoom out to see it all. There really is no comparison. My suggestion to the ASA is that if a network can’t do 1000Mbps (1Gbps), with an easy upgrade to 10Gbps, then it’s not pure fibre optic broadband, which is of course le meilleur réseau.